So last weekend, while I was at my mother's house and casting about for things with which to occupy myself, I found myself raiding a drawer of tee-shirts to turn them into hats for babies in Haiti. I swear, there must be two hundred tee-shirts in her house - but that I had the time to cut and sew more. Two tee-shirts, a red one and a yellow one, became four little baby hats - one yellow, one red, and two half and half. But then, the remaining pieces of the shirts cried out to me, "you can't throw us out! 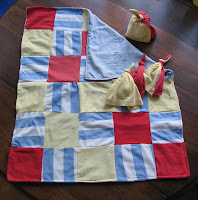 ", so with a rolling cutter (a genius device if ever there were one), I cut out a mess of 5" squares, sewed them together, backed it with a piece of a flannel sheet, and tied it with red embroidery thread. Ta da! You may notice that there's some blue & white striped fabric in that there quilt, but no matching hats. Well, that's because the first two hats I tried, using a blue & white polo shirt, were a complete disaster because I failed the cardinal rule of sewing: I sewed the right side to the wrong side. And since it's a jersey knit, it was just impossible to rip the seam so I gave up. Today, the hats and quilt are going in the mail to Maine, and from there they'll be packed up to be sent to Haiti, to be included in Safe Birthing Kits. These kits - consisting of plastic sheeting, hand sanitizer, a sterile piece of string and razor blade, and these newborn baby caps - have the potential to reduce infant and maternal mortality, and give babies a safer, healthier start. There is something inordinately gratifying about repurposing a tee-shirt to help make the world a slightly better place. My quilt guild makes quilts for the local hospital - there are a number of below-poverty families in the area who manage to get to the ER for the birth, but have nothing - no baby clothes, no blankets, no crib - for the baby. We make blankets, hats, and anything else we can think of, and the hospital hands them out as needed - no baby should come into the world without at least a warm blankie to welcome them. Thanks for expressing your compassion this way - the world is a better place for it. Actions speak louder than words so this is great. Happy to hear you weren't one of those crazed Black Friday shoppers. Giving is so much better than shopping! So crafty and so kind. I've always liked the idea of quilting from things I already owned, so maybe hats and quilts are a future project . . . I've honestly never wished I could sew for my own sake, but this makes me wish I did. I second the comment- Actions speak louder than words. This is such a wonderful idea! Thanks for sharing. They are really beautiful - very talented lady! But the thought of giving birth in a situation where those insignificant things make such a huge difference just about stopped. What a wonderful idea, and how crafty you are! I sometimes knit loads and loads of hats and mitts for underprivileged kids. I like it. This is so great. And beautiful. This is SO awesome. Good on you, babe. I didn't give you credit today--and I should have--but this post inspired me to start looking for other such charities that ask for craftmakers. I can't sew well, and I can't knit (though I'm going to learn eventually)but I can crochet. So I am currently working on an afghan for Project Linus, and I see other projects in my future. BTW, Save the Children has a "make a baby cap" project going from now until Jan 31,2009. You are supposed to make a cap, print out a tag AND write a note to President (!) Obama. Samples of the caps and the letters are going to him in January to ask his help for babies all over the world.